The Steve Miller Band is an American rock band formed in 1966 in San Francisco, California. 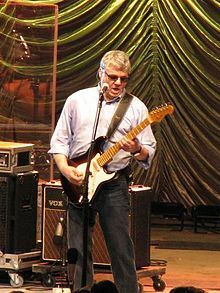 The band is led by Steve Miller on guitar and lead vocals. It is best known today for a string of (mainly) mid-1970s hit singles that are staples of classic rock radio, as well as several earlier acid rock albums. Miller left his first band to move to San Francisco and form the Steve Miller Blues Band. Shortly after Harvey Kornspan negotiated the band’s landmark contract with Capitol/EMI Records in 1967, the band shortened its name to the Steve Miller Band. In February 1968, the band recorded its debut album, Children of the Future. It went on to produce the albums Sailor, Brave New World, Your Saving Grace, Number 5, Rock Love and more. The band's Greatest Hits 1974–78, released in 1978, sold over 13 million copies. The band continued to produce more albums and in 2014 toured with the rock band Journey. In 2016, Steve Miller was inducted as a solo artist in the Rock and Roll Hall of Fame. In 1965, after moving to Chicago to play the blues, Steve Miller and keyboardist Barry Goldberg founded the Goldberg-Miller Blues Band along with bassist Roy Ruby, rhythm guitarist Craymore Stevens, and drummer Maurice McKinley. The band was contracted to Epic Records after playing many Chicago clubs. They also appeared on Hullabaloo with the Four Tops and the Supremes. Miller left the group to go to San Francisco, where the psychedelic scene was flourishing. He then formed the Steve Miller Blues Band. Harvey Kornspan, managing partner, wrote and negotiated the band's landmark contract ($860,000 over five years as well as $25,000 of promotion money that was to be spent at the band's discretion) with Capitol/EMI Records then-president Alan Livingston in 1967. Shortly after, the band's name was shortened to the Steve Miller Band in order to broaden its appeal. The band, consisting of Miller, guitarist James Cooke, bassist Lonnie Turner, drummer Tim Davis (who replaced the departing Lance Haas on drums) and Jim Peterman on Hammond B3 organ, backed Chuck Berry at a gig at the Fillmore West that was released as the live album, Live at Fillmore Auditorium. Guitarist Boz Scaggs joined the band soon after and the group performed at the Magic Mountain Festival and the Monterey Pop Festival in June. In February 1968, while in England, the band recorded their debut album Children of the Future at Olympic studios with Glyn Johns as engineer/producer. The album did not score among the Top 100 album chart. The second album Sailor appeared in October 1968 and climbed the Billboard chart to #24. Successes included the single "Living in the USA." Brave New World (#22, 1969) featured the songs "Space Cowboy" and "My Dark Hour". "Paul Ramon" (alias Paul McCartney) played drums, bass and sang backing vocals. This was followed by Your Saving Grace (#38, 1969) and Number 5 (#23, 1970). In 1971, Miller broke his neck in a car accident. Capitol Records released the album Rock Love, featuring unreleased live performances (including an 11-minute jam on the title track) and studio material. This is one of two Steve Miller Band albums not to be released on CD, the other being Recall the Beginning...A Journey from Eden. In 1972, the double album compilation Anthology was released, containing 16 songs from the band's first five albums. The style and personnel of the band changed radically with The Joker (#1, 1973), concentrating on straightforward rock and leaving the psychedelic side of the band behind. The title track became a #1 single and was certified platinum, reaching over one million sales. It was awarded a gold disc by the RIAA on January 11, 1974. Three years later, the band returned with the album Fly Like an Eagle, which charted at #3. Three singles were released from the album: "Take the Money and Run" (#11), "Fly Like an Eagle" (#2) and their second Number One success, "Rock'n Me". Miller credits the guitar intro to "Rock'n Me" as a tribute to the classic song by Free, "All Right Now". Book of Dreams (#2, 1977) also included three successes: "Jet Airliner" (#8), "Jungle Love" (#23) (later becoming the song played over the opening credits of the 8th season of the sitcom Everybody Loves Raymond), and "Swingtown" (#17). 1982's Abracadabra album gave Steve Miller his third Number One success with the title track. Miller's hit pushed Chicago's "Hard to Say I'm Sorry" out of the #1 spot, just as his "Rock'n Me" had knocked Chicago's "If You Leave Me Now" out of the #1 spot in 1976. 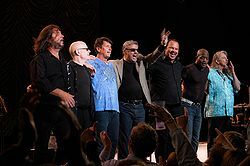 Released in 1978, The Steve Miller Band's Greatest Hits 1974–78 has sold over 13 million copies, and Miller continues to perform sold-out concerts. Bingo!, a new album of blues and R&B covers, was released on June 15, 2010. Let Your Hair Down, a companion release to Bingo!, was released 10 months later, on April 18, 2011. Founding member Tim Davis died from complications due to diabetes on September 20, 1988, at the age of 44. Longtime band member Norton Buffalo died from lung cancer on October 30, 2009. John King (drummer during "The Joker" era) died after a short bout with kidney cancer on October 26, 2010. James Cooke died from cancer on 16 May 2011. Blues guitarist Jacob Peterson officially joined the band before the Spring 2011 tour. Following Petersen joining the band, longtime guitarist Kenny Lee Lewis switched instruments to become the band's full-time bassist. On November 10, 2011, the band played inside the Boeing factory in Everett, Washington, to celebrate the successful delivery milestones of the 747-8 program. They opened the set with "Jet Airliner." In 2014, Steve Miller Band toured with fellow San Francisco rock band Journey. The group has been releasing albums and singles since 1968 and currently has released 18 studio albums, six live albums, seven (official) compilation albums, and at least 29 singles. All together the band has sold over 60 million copies. ASCAP Golden Note Award, 2008. 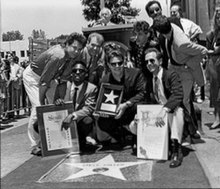 Star for "Recording" on the Hollywood Walk of Fame on 1750 Vine Street. ^ "20 Albums Rolling Stone Loved in the Sixties That You've Never Heard". Rolling Stone. Retrieved 9 April 2015. ^ Christgau, Robert. "Steve Miller Band". robertchristgau.com. Retrieved 9 April 2015. ^ "Steve Miller Band". Rateyourmusic.com. Retrieved 2008-11-13. ^ "Chuck Berry News". Chuckberry.us. Retrieved 2014-08-23. ^ Murrells, Joseph (1978). The Book of Golden Discs (2nd ed.). London: Barrie and Jenkins Ltd. p. 332. ISBN 0-214-20512-6. ^ a b Billboard book of number 1 hits. Google Book Search. ^ Jake Grove (2008-10-15). "The Steve Miller Band hits Littlejohn in Clemson". Independent Mail. Retrieved 2014-08-23. ^ "Steve Miller Band announce new album". Planet Rock. 2011-02-11. Retrieved 2011-12-30. ^ "James Cooke (aka Curley)". Retrieved 2011-10-06. ^ Original bassist Lonnie Turner died on April 28, 2013. His time with the band led to songs such as Jet Airliner, Swingtown, Take the Money And Run, Jungle Love and many more. ^ "Boeing's Surprise Musical Guest: Steve Miller". Retrieved 2011-11-10. ^ "Steve Miller Band Official Site". Stevemillerband.com. 2014-05-18. Retrieved 2014-08-23. ^ "ASCAP to Honor Steve Miller and Lionel Richie at 25th Annual Pop Music Awards". Ascap.com. Retrieved 2014-08-23. ^ "Steve Miller Band". IMDb. Retrieved 2016-06-14. ^ "The Steve Miller Band". latimes.com. Retrieved 2016-06-14. Steve Miller is not currently on tour.